We’ll use ret2libc technique instead of jumping on stack. Reading symbols from /home/yesMan/X...(no debugging symbols found)...done. Hard-coded _DTOR_END__, and no DTORs present. Read-only .dynamic section and _fini pointer. However, GOT is writable at run time. With writable GOT we can transfer the execution to any address by overwriting an imported library function address. But, after printf no foreign functions are executed under normal conditions. 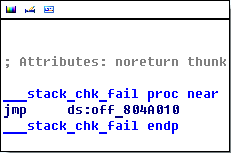 The only opportunity to exploit GOT overwrite is to corrupt stack canary and get __stack_chk_fail called. First way is very unreliable because of stack ASLR. It involves overwriting several addresses at stack with garbage, hoping that we match with current randomized stack address and STK_COOKIE gets overwritten. It’s a way to go if we have a spare 30 minutes for bruteforcing stack ASLR. Second way is more interesting, because it provides 100% exploit reliability. When the CPU runs across a segment selector (gs: is one) in flat memory model, it reads LDT to find the segment’s base address, and simply adds up that base and offset specified to get linear memory address to work with. 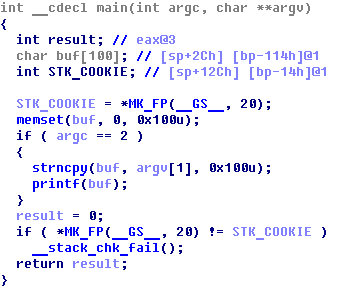 gs: segment base address is 0x4017e6c0, so saved stack cookie resides at 0x4017e6d4. Works like a charm! We tricked the binary into believing we smashed the stack. Yes, this it ok. The segment offset mask is 0x000fffff shows it is the GS segment. Although, your glibc address space seems to be randomized, since the segment has a base of 0xf75896c0. Make sure you circumvented ASLR using ulimit -s unlimited before taking the core dump.